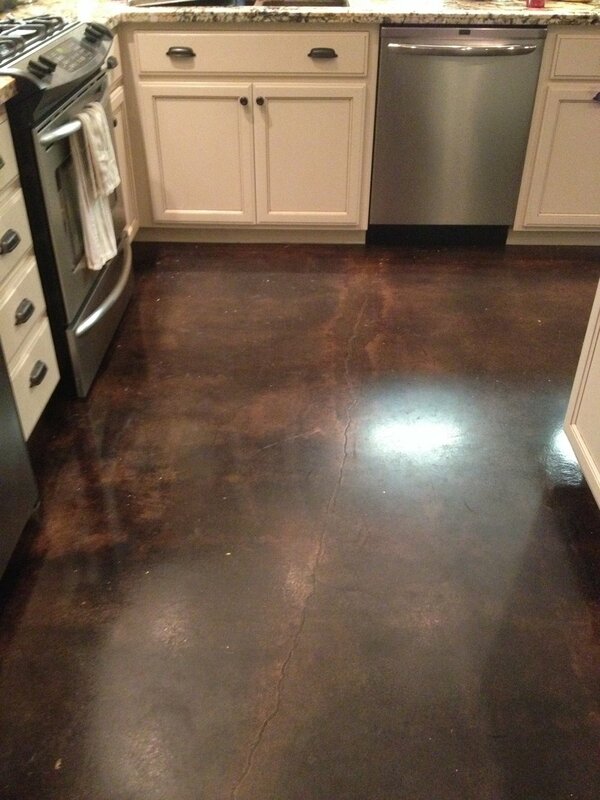 Stained concrete comes in a variety of applications. You can use an acid based stain that is popular for a rustic natural earthy coloration or use a more consistent acrylic based concrete stain for more control and color styles. There are also concrete dye stains that opens up the color palette even more. 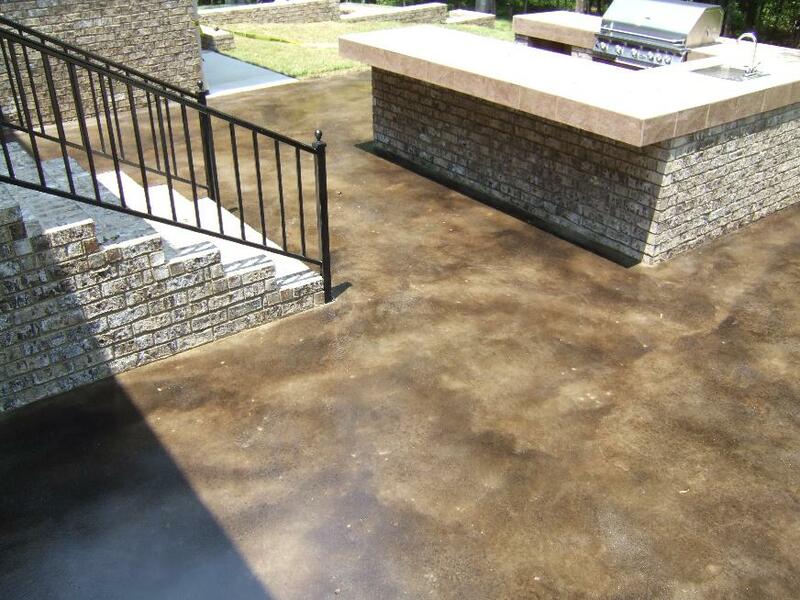 Learn more on the various types of stained concrete below. 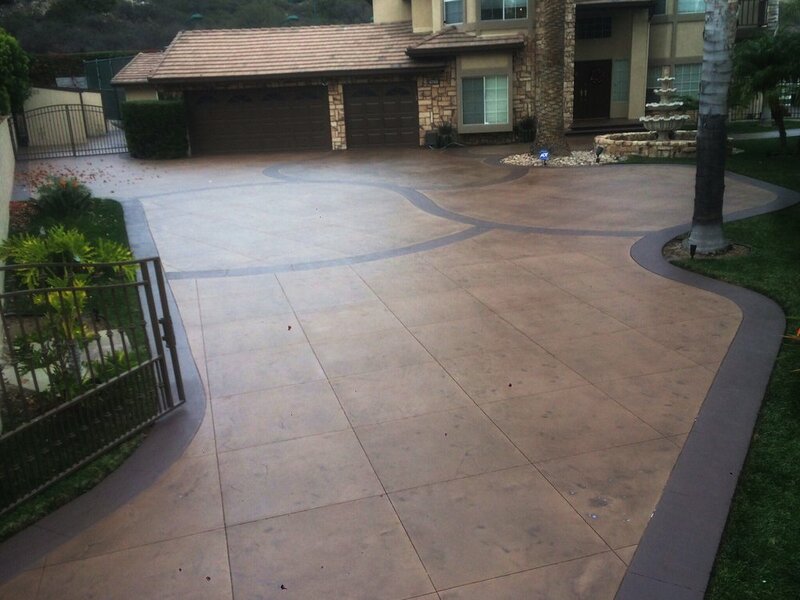 Technically made up from an acid base solution, wetting agents, and metallic ions, this stain penetrates and reacts with the free-lime and minerals in the cement concrete mix to produce a variety of mottled colors and design effects that are permanent and will not chip or peel. It colors the concrete by chemically combining the metallic ions with particles in the concrete to form oxides creating the variegated, mottled coloration so no two applications are the same, and there is no true uniform look to it, adding to the old world charm, or modern sophistication. 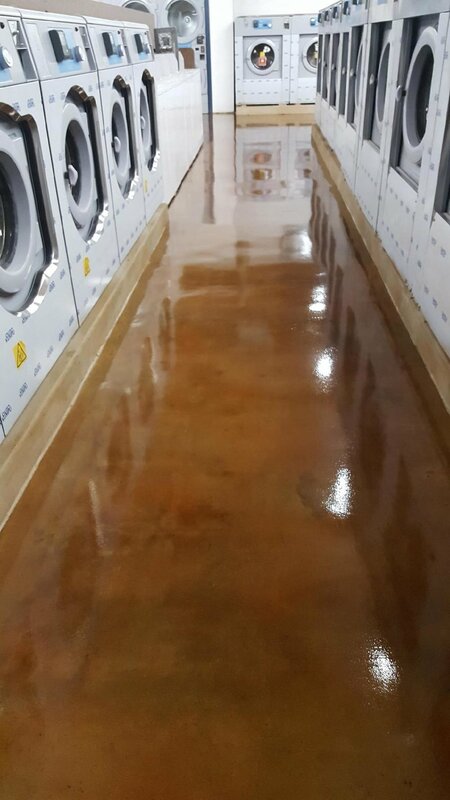 After prep and application, depending on the slab, stains react for approximately 4 hours, then is usually lightly stained again either with the same color or an accent. The next day we neutralize the remaining acid residues; allow the floor to completely dry and apply either our 100% solids epoxy and/or our 2 part polyurethane topcoat for rich, deep colors, and a unique floor that will last for many, many years with little to no maintenance depending on foot traffic. The colors are limited to 8-10 colors from any given manufacturers; Aqua Blue, Canyon Red, Chestnut, Walnut, Mint/Green, Bronze, Burnt Umber, Chocolate, and Black. The floor to be stained must be 100% free of any oils, sealers or wax or will have NO chemical reaction or color penetration. 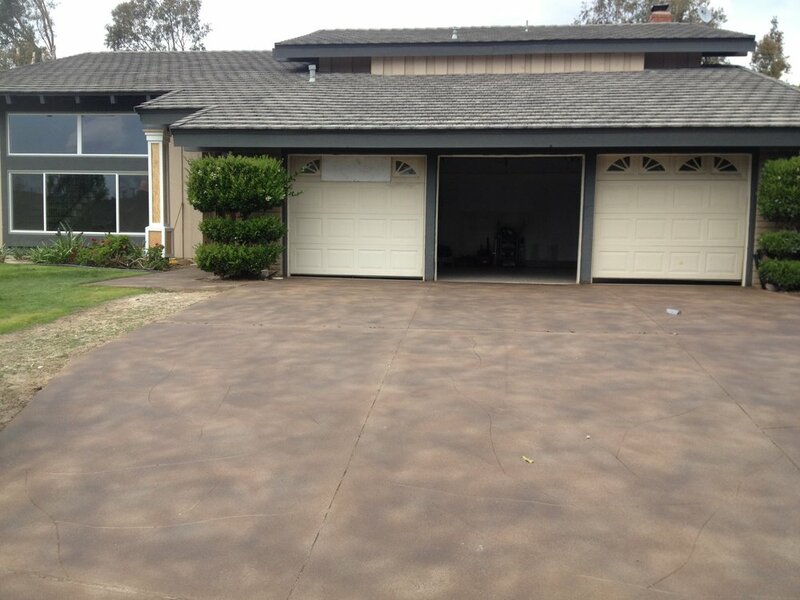 Acid Stain is transparent so it WILL NOT hide imperfections or heavy stains in the concrete. If the concrete area is too old and/or heavily stained a skimcoat overlay can be done first for an additional cost. Water-based stain and dye systems are used as an alternative to solvent and acid stains. Only now becoming more and more popular as customers have since only been aware or known of acid stain. These are easy application, fast turnaround stains when time and money is an issue. In some cases the staining and sealing can be done in 1-2 days. 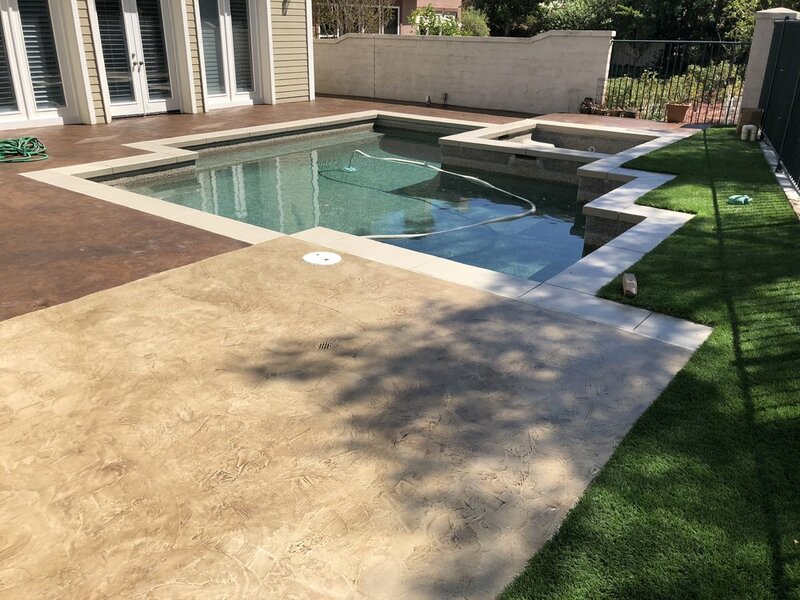 However, even though they are fast, the quality is not compromised due to the full penetration of the dye into the diamond prepped and porous concrete and the tenacious bond of the acrylic stain. 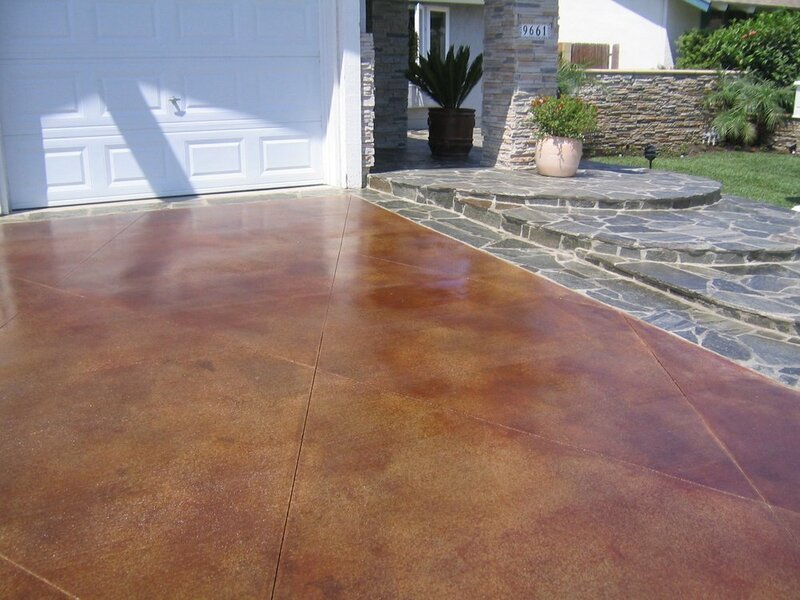 These stains are great for rejuvenation of any concrete surface area or as a first time stain that’s available in 30+ colors from natural earth tones to vibrant reds and blues. Depending on the desired effect, you can take these stains from transparent to almost solid. Creating bold color schemes, used as a washing and softening effect, these stains in combination have great range of esthetics, variegation, mottling, and antiquing of the surface. 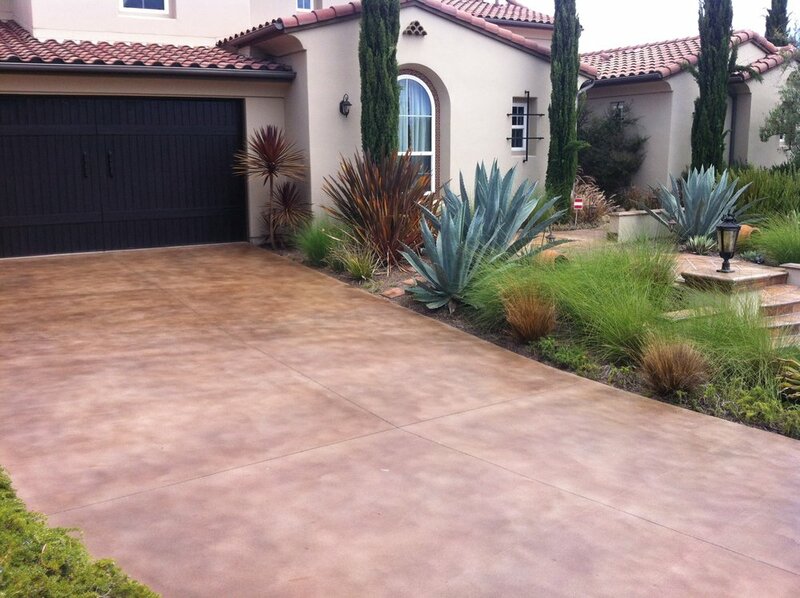 Acrylic stain and Dye is transparent so it WILL NOT hide imperfections or heavy stains in the concrete. If the concrete area is too old and/or heavily stained a skimcoat overlay can be done first for an additional cost. Color Seal is a water based acrylic or solvent-based urethane sealer that contains reflective pigments, is UV stable coating that helps reflect the suns infra-red rays, which are responsible for the increase in temperature on the surfaces exposed to the sun; thus providing a surface that’s 20-40 degrees cooler. It’s great for driveways, patios, walkways, tennis courts and extremely popular “Kool-Life” for pool decks. It’s extremely flexible, durable, water repellent, and notably abrasion resistant. Available in over 30+ standard colors, is also available for computer color matching for a custom blend. This product does not require a primer as a paint does. 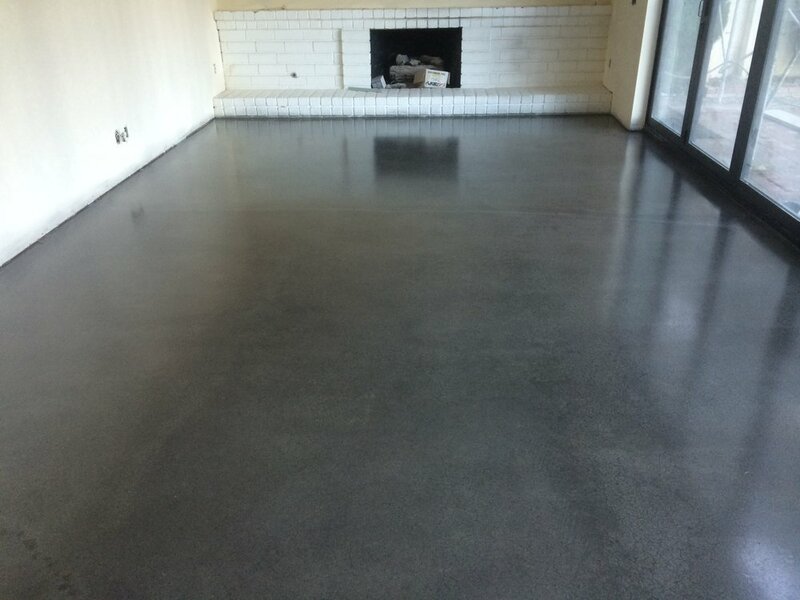 This product is a solid not transparent so it WILL hide any imperfections or heavy stains in the concrete. 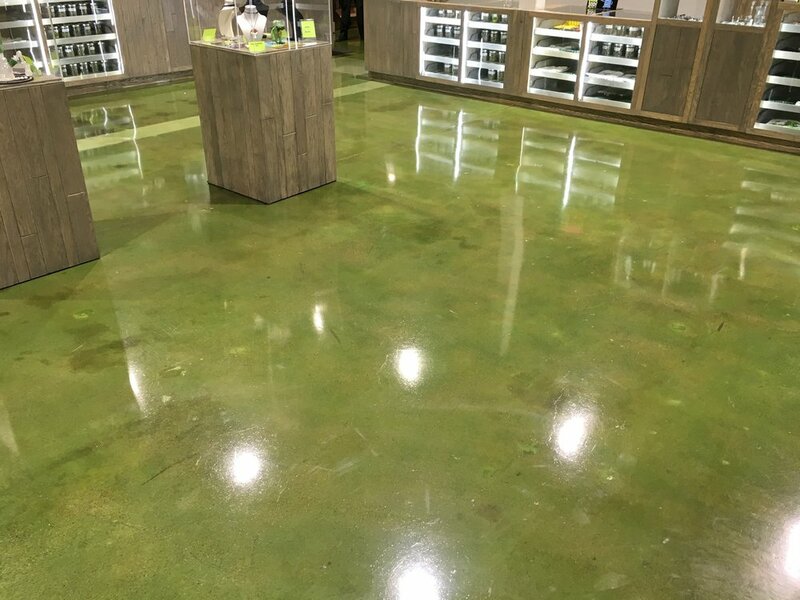 Typically Concrete stains can range between $2.50 – $6 per square foot depending upon the difficulty of the design, indoors/outdoors application and applied on slab or overlay. The cost should likely compare to high end carpet, hardwood floors, slate, stone and designer tiles. 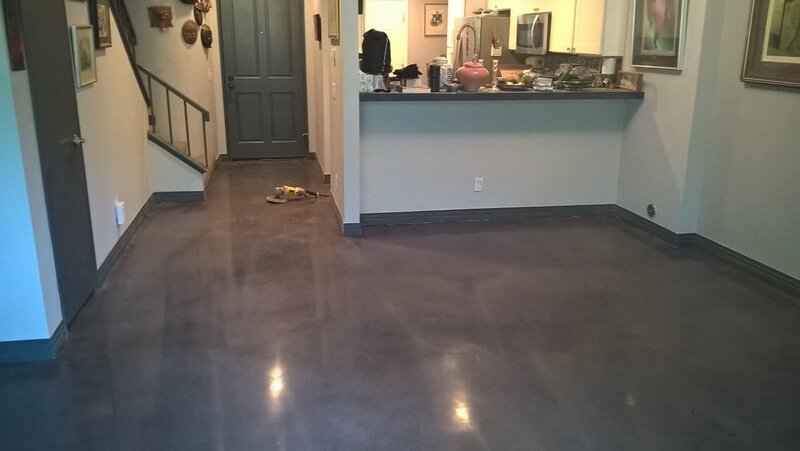 Unlike other flooring options, stained and sealed concrete floors do not harbor allergens and adjust to the room’s temperature keeping it comfortable throughout the seasons. Ultimately you can transform your plain, grey slab into an expansive canvas, full of life and color with little to no maintenance whatsoever.